Historic Oologah is the birthplace of The Cherokee Kid, known as America's Favorite Cherokee Cowboy, Will Rogers. Oologah is 30 minutes northeast of Tulsa on Highway 169 in northwest Rogers County. Oologah emerged as an Indian Territory coal mining boom town. It soon became a shipping point for coal mined in the area because of its location on the Iron Mountain and Southern railroad line. In 1906, when Oologah was still a town in Indian Territory, the Bank of Oolagah was built due to the need for a safe depository and other general financial operations. It was one of the first banks in northeastern Oklahoma. The only bank in the area for over twenty years, and it existed as a commercial building for approximately eighty years. Will Rogers said he told folks he was from Claremore because no one but an Indian could pronounce Oologah. The town's name is a Cherokee word meaning "dark cloud." Oologah (pronounced oo'-la-gawh) was also spelled Oolagah prior to Oklahoma's statehood (1907) and still is at some historic buildings. 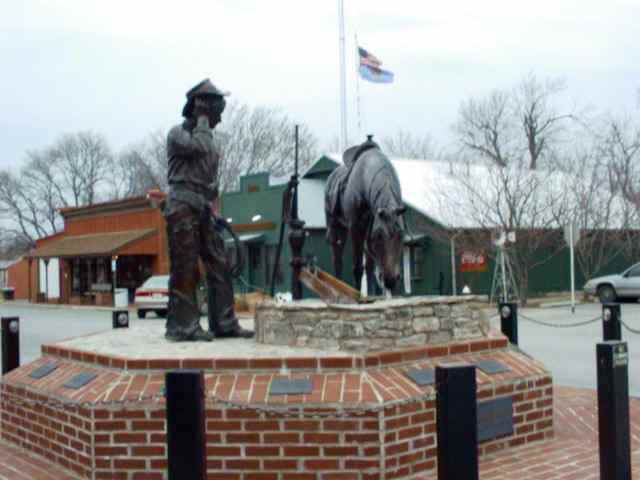 On August 12, 1995, the 60th anniversary of Will Rogers' tragic death, his son, Jimmy Rogers, and actor Ben Johnson from Pawhuska, Oklahoma unveiled The Cherokee Kid, a monument sculptured by Sandra Van Zandt, in downtown Oologah that portrays Will pausing for a drink at the old town pump with his favorite quarterhorse, Comanche. The Indian Territory town centered around the pump, a source of water for the community as well as the teams of horses bringing goods and people to the train depot, which is where Will met his wife, Betty. The Oologah Historical Society commissioned local sculptor Sandra Van Zandt and impressionist Gary Moeller for the life-size bronze sculpture of Will. The base of the monument is the volunteered works of engineer Mark Rouk and general contractor Charles Buchfink. The monument depicts a bronzed moment in time just before statehood, around 1904 to 1906. The community came forth with most of the contributions from it's private individuals and small area businesses. The old pump, having been welded shut many years ago, was thought to need a new water line. However, after the new line was installed to the monument, volunteers found the pipe to the old artesian well, so the new line was shut off, and the well's original line now supplies water from the pump again. Will was born November 4, 1879 on The Dog Iron Ranch in the Cherokee Nation. Located just northeast of Oologah, the ranch, open daily for visitors, is now a living history ranch with longhorn cattle, goats, sheep, geese and peacocks.